What do you picture when you hear about someone who’s a millionaire? Let me take a stab at it . . . .
Perhaps a well-groomed old man lounging in his bathrobe, sipping on a tall glass of some complicated beverage, overlooking acres of achievement from the portico of his mansion? Or maybe you see a fine-dressed young lady, confidently walking the through a Manhattan park on her way to the corporate meeting where she will soon land a business deal worth fifty years of your income. It’s a title you may have never dreamed you could ever give yourself. What if you could? What if? I want you to envision yourself as a millionaire. Imagine all the good you could accomplish in the world. Dream of the possibility. Believe you can become one. It actually could be simpler than you think. Before I show you some surprisingly simple ways to become a millionaire, take a moment to reflect on just how wealthy you are already. Head on over to GlobalRichList.com. There, you can enter your annual net income or net worth and compare your wealth with the rest of the world population. You have a hunch about the results you’ll get, don’t you? Say you make $20,000 in net income every year. Guess what? You’re in the top 3.65% richest people in the world by income. Imagine if you make more! Keep the proper perspective. Don’t whine because you’re not a millionaire yet. It’s okay to dream, but remember that contentment should be a cornerstone of your financial plan. Simple tasks are not always easy tasks. If I were to hand you a spoon and ask that you dig a hole nine feet down into packed soil, that’d be pretty straightforward and simple but it certainly wouldn’t be easy. Likewise, you’ll find some of these simple ways to be just that – simple but not easy. But come on, you’re tenacious enough for the job, right? One last thing. 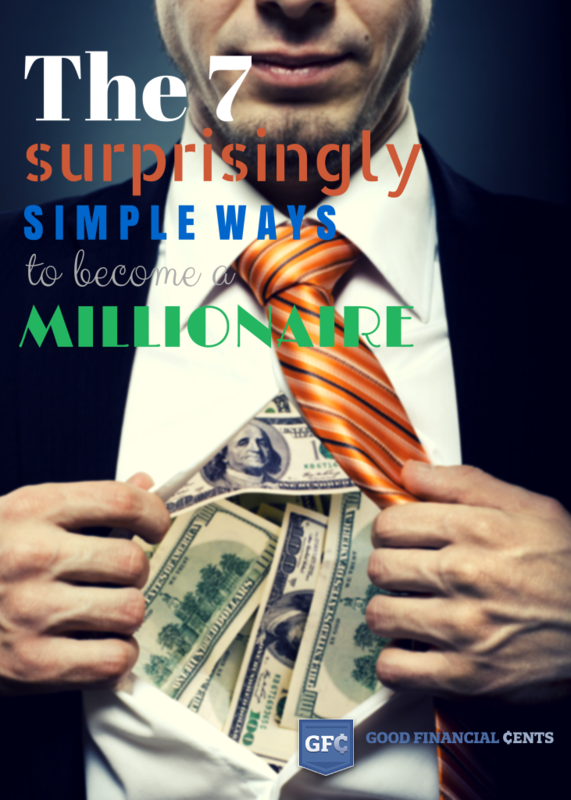 Remember that many of these tips are surprisingly simple, don’t underestimate their effectiveness just because you’ve “heard that one before.” Put these babies to good use and watch your millionaire potential soar! Identify your competition. How hard are they working? What are some differentiators you can bring to your workplace or market? Start by working smarter. There’s no use in working harder if your work isn’t effective at producing income – you’ll be spinning your wheels. There’s no sense in selling ice cream cones on your front lawn in the dead of winter. Instead, set up a booth at the park in the sizzling summertime – you get the idea! Simple, commonsense changes can greatly improve your effectiveness. Work harder than others are willing. We’ve all seen the guy or gal at the office who works harder than anyone else. Maybe they’re a little nerdy or a little too interested in their job – or are they? Maybe they’re onto something. After all, aren’t they the ones getting the promotions? Aren’t they the ones who become the office linchpins? I remember when began my career with A.G. Edwards & Sons in 2002, I was in a training class of around 55 people. After completing training a year later, our class was reduced to less than half. My fifth anniversary mark? Only five of us were left. Most failed. Why? Because they weren’t willing to put in the hard work required. I beg you to not be afraid of hard work. Not only will your boss feel better about what you’re doing for them – you will too. Everyone makes them. I do, you do, we all do. And believe me, I’ve made some pitiful mistakes. Would you get suckered into two multi-level companies that go nowhere? Would you throw $8,000 into an online business venture only to lose it all? Those are just a couple of several investment mistakes I’ve made with my money. Mistakes are difficult to swallow. I think our first gut reaction as human beings to the realization we messed up is to shift blame – to others or to circumstances. The very best way forward is to admit we fumbled the ball. Are you willing to admit when you make mistakes? Some people, when faced with their own inadequacies, beat themselves up. And you know what that does? It paralyzes them from making the decisions they need to make to achieve success. It’s important to remember that . . . . So, take the simple step to fess up and move on. Yes, it’s simpler than you think – especially once you have practice. If you are still in the middle of a debt mistake one of the best things you can do is to stop paying interest by transferring your balance over to a 0% APR credit card. This will free you up to hammer down on that debt instead of paying big interest payments. Millionaires don’t give up because of a few silly mistakes. They press on toward the goal. 3. Build something new that you would love – and be sure to experiment. You can read book after book about how to research what your customers will love, and by the time you deliver it, they’ll already be bored with it. If you’re the entrepreneurial type – I know I am – make sure to work on projects you can get excited about! Chances are, if you create something that you’d use and love, others will too. Millionaires understand that some of the best ideas don’t come out of costly research, they come out of a passion for making the world a better place. Also, remember to experiment. Have fun! Some of my best ideas come out of experimentation. In 1945, Percy Spencer experimented with a new vacuum tube while doing research for the Raytheon Corporation. He popped popcorn and melted a candy bar, and saw the great potential for this process which eventually culminated into the advent of the microwave. Tim Cook, the CEO of Apple recently explained in an interview with Charlie Rose that it’s more difficult to edit than it is to create something entirely new. But I’ve learned that sometimes creating something new can be the best way forward to becoming a millionaire. One of the things that I’ve been most excited about building is my blog. My financial planning practice was growing at a steady rate but after I launched GoodFinancialCents.com in 2008 my practice and revenue have grown significantly. Some of that is a direct result of getting new clients to my practice while the other more surprising revenue source has been directly from the blog. A combination of advertising revenue and introduction to new business opportunities (because my name and face are all over the web) have been a huge blessing. Here’s the thing you have to realize though: I KNEW NOTHING ABOUT BLOGGING. That’s right. The launching of my blog was a total experiment and still is today. I’m always testing different ways to monetize and build my brand. Experimenting is the fun part! 4. Learn to budget – or at least get help doing so. You know that I hate budgeting. Thankfully, my wife budgets like a pro. If you don’t budget, I promise you’ll lose money to overspending. Want to make yourself sick? Count up how much you’re spending on eating out, clothing, gadgets, and other delights and write it down. Then, start budgeting. After a year, look at how much you’re spending and compare with your initial count. Yikes. Try not to lose your lunch. A hugely important part of budgeting is ensuring you’re spending less than you’re making. And the only way to do that friends, is to track everything. If you’re not a spreadsheets-kind-of-person, that’s okay. Just make sure you have some help. 5. Start investing – it’s simpler than you think. Millionaires many times become millionaires – and stay millionaires – because they invest. The good news? It’s actually pretty simple. Betterment is a great place to start when you’re new to investing. They believe that investing doesn’t have to be complicated, and that if more people had an easier way to do so, they would. With Betterment, you really only have three decisions to make: how much money to invest, how often you want to invest it, and how you want your asset allocation to look between stocks and bonds. Boom. You’re done. I like that. There are other ways to start investing, too. For example, Personal Capital can help you manage your investment accounts as you get more sophisticated. Here’s my point: You don’t have to be a rocket scientist to start investing. Just start somewhere. It’s okay if you don’t have a lot of money to invest right away. I started with investments at a very young age, with a little help from my mom. I dare you to read a little more about my first investments – you’ll soon discover that starting small is totally fine. Start investing a few bucks and I’ll applaud you! Also, once you start investing, don’t abandon the ship. The stock market has its ups and downs. Just ride the wave. Think long-term! Lastly, remember that investing doesn’t always have to be in the stock market. Some of the best investments I’ve made have been investing in things outside the stock market. This includes investing in my business, myself through certifications and a business coach, and my blog. Need some encouragement to get started investing? Join Operation: Invest Now where I’m encouraging 1 million people to invest in themselves. 6. Don’t believe discouraging people. As soon as you accept that you’re not going to become a millionaire, you probably won’t – you’ll settle for the ordinary. After all, your beliefs affect your actions, and your actions affect your outcomes. When you listen to discouraging people, you’re letting them accomplish their goal – to drag you down and ensure you don’t surpass their success. No good. Instead, I suggest you prove them wrong – but be humble about it. Your results will speak louder than your words, I promise you. 7. Save some of your income for a rainy day. If you’ve lived on this planet for any considerable number of years, you know that bad stuff happens. Not only that, sometimes several bad things happen all at the same time. Talk about knockout power! That’s why I recommend that you save some of your income for a rainy day. Medical emergencies can last years. Don’t get caught without an emergency fund. You hear? What does this have to do with becoming a millionaire? I’ll tell you. If you have an emergency and don’t have some liquid cash saved up in a savings account like one from Capital One 360, you’re likely to either go into debt (bad idea) or borrow from family members (very bad idea). Don’t be the guy that owes his parents. Don’t be the couple that drowns in debt. Think of debt as the polar opposite of investing. Instead of you investing in companies, companies are investing in you – looking to make as much profit as possible by pulling it out of your wallet. It’s bad news people. According to many experts, you should have around three to six months of expenses in your emergency fund – in bad times, I recommend you shoot for eight months. Get Out There and Become a Millionaire! Yes, many of these methods are surprisingly simple. They’re easy to understand! Doing them is another matter. But I believe in you. Remember, it’s okay to pursue millionaire status. But don’t do it for the fame. Pursue it for your family. Pursue it for your community. Pursue it for a purpose greater than yourself. And hey, after you earn a million dollars, read my article on how I would invest it. Love it! You never know unless you try. Dare to dream big. Don’t worry about starting small. With a business, you don’t have to have a million dollar business idea. Just start with an idea because you never know where it’ll take you. Even if your original idea itself doesn’t turn you in to a millionaire, it could open doors or lead you down the path that does turn you in to a millionaire. And I would add “Start Young” (if possible). When I think about how much money and time I wasted not focusing on my future it almost makes me want to cry! Really great advice. I would be pleased if we could continue to have a good lifestyle. No luxury, just a roof above our heads, a vacation now and then, paying the bills on time and saving some money. And, of course, enjoying each day. Great podcast! Suddenly the idea of being a millionaire at retirement IS possible. I am definitely sharing…thanks for taking the time! Sounds cool. There are definitely a lot of inspiring stories about self-made millionaires. With so many people getting buried in debt right now and still no educational system adopting a program for teaching financial literacy, I believe more and more people are bound to experience having their hard-earned money go down the drain eventually. I’ll certainly share these podcasts with my readers and friends so that they can educate themselves more and apply some of the tips of these self-made millionaires. Thanks! Thanks Jeff and Jaime. So glad you all are attacking the financial literacy problem we have nationwide. There is huge value in learning from others who have conquered their financial future. Keep it up!